What does it mean to be working class today? I spoke to several young women who defined themselves as working class and feminist. Victoria felt it was more than a socio-economic thing – being working class is more a question of culture, politics, what interests you and how you spend your time than how well off you are. Hannah thought it was about permission, entitlement, confidence and how various factors can conspire to narrow the horizons of and constrain the working classes. Chloe said being working class meant not being able to afford to go on holiday or have a car. The term “working class” seems outdated, a throwback from an industrial age that has now come to represent something different to everyone. But while it is hard to pin down, it still has a power to conjure strong feelings. It would be nice to think that in 2016, class has become more fluid – a permeable membrane through which people, ideas, culture and music move freely. Yet instead of moving forwards we’re hurtling backwards. It’s dizzying. The rhetoric around Brexit is creating the equally ugly images of pompous London-centric metropoles protesting into their ‘liberal’ right-on echo chambers on social media, in opposition to the red-faced, UKIP proles dragging their knuckles and dribbling into their Stella. This is coupled with a Tory government aiming to bring back grammar schools (make ten-year-olds sit exams that will define their entire future prospects and self esteem – nice!). Despite the social mobility protestations, this ultimately invests in those who are already more advantaged. On top of this, there are unaffordable university fees, an increasing prevalence of unpaid internships and nauseatingly high rent prices in our cities, all of which are pricing young people from lower income backgrounds out of the best opportunities. “We’re all middle class now,” sang Labour, with their shiny faces in 1997. Jump forward and the yawning fat cat gap is widening like never before. Although the incredible work by Everyday Sexism, UK Feminista and He4She as well as US big shots Lena Dunham, Sheryl Sandberg and the rest cannot be dismissed, working class women’s voices are missing from these feminist dialogues that get all the column and TV inches. Are feminist voices really reaching the people that arguably need them the most? Are they even relevant if they do? Of the feminist megastars, our working class hero could be Caitlin Moran. Brought up in in a low income family in a council house in Wolverhampton, she injects a lot of fun and wanking into demystifying capital F Feminism, but as more eloquently explained by Laurie Penny, her story is a specific one that might entertain and inspire, yet is limited in scope and resonance. Her audience is primarily the largely white, middle class, hardback book-buying and Times online-subscribing public. Her megawatt-charisma generates a faithful legion of middle class (often teenage) fans who adore her. The gobby, knockabout, hand-me-down, cosy camaraderie of Moran’s youth doesn’t ring true with growing up working class today. There is a loss here for working class women and girls. I spoke to Mica who was living in a temporary accommodation, a hotel, while waiting for news on a council flat or room share. Born and bred in London, on an estate in Kensington and Chelsea, she has been priced out of the private rental market in her home borough by the mind-boggling cost of property in our capital. Her voice was strained and she was angry. She’s 26. She spoke of friends who had been relocated to council housing in other parts of the country – arbitrarily having to up sticks and move a moment’s notice, away from family, friends, community and everything they’ve ever known. If you have kids, she says, there’s no choice but to go. Mica spoke about the gender pay gap debate dominating the feminist agenda and how this only applies if you’re earning a salary. If you’re working for the minimum wage, there is no unjust discrepancy between men and women to be re-addressed. When you’re struggling to feed your family and visiting food banks because your tax credits have been cut, you’re not thinking about body shaming and the pornifcation of our culture. When you stay with an abusive partner, because women’s shelters and services have been closed and you can’t afford to live independently, the Bechdel Test and gendered toys aren’t going to be at the top of your list. Moran was recently interviewed by multimillionaire and Ivy League-educated actor Emma Watson. I dearly wish she’d been interviewed by Mica. What a powerful message that would have been. The photo was taken by Judy Seidman and is used under a creative commons licence. 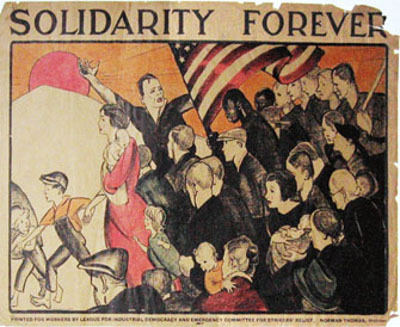 It shows a poster designed by Anita Wilcox during the Great Depression in the USA in order to express solidarity with the the struggles of workers. The poster is yellowed and torn at the edges. 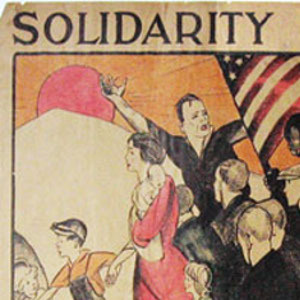 It is a coloured drawing of a crowd of people seemingly marching together, with one near the front turning back and encouraging others, and someone else holding a flag of the USA. A stylised mountain and sun are in the background. At the top some writing reads SOLIDARITY FOREVER.